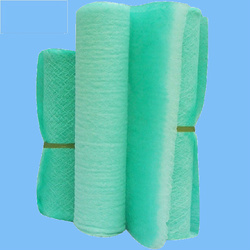 We offer an exclusive range of fiberglass filter material. Reverse Air or Shake/Deflate Cleaning Supertech offers a line of fiberglass filter media specifically designed and finished for Reverse Air or Shake/Deflate cleaning that offers superior performance in fossil fuel burning power plants, asphalt production, cement production, carbon black production and refineries. Fiber glass filter with BF 400. A Polyester scrim is reinforced on the air exit side. The fibers are oiled to avoid the release for the dust after the capture of the filter. Available in different sizes on request. Initial pressure drop is 48 PA and Final pressure drop is 250 PA.